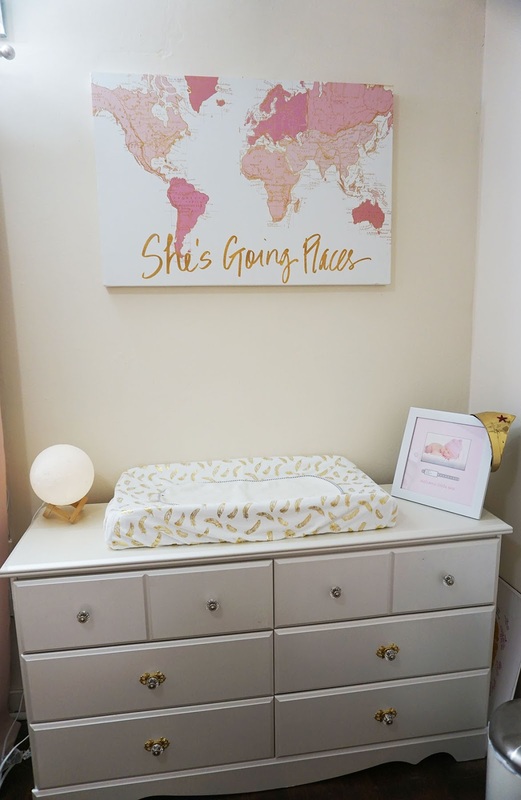 I'm so excited to share with you baby girl's nursery tour! It's actually been done for a while, I just added a few touches from baby shower gifts but my family really put it together for us as a surprise after our babymoon. The theme is blush, cream and gold with some personal touches like travel theme. This bookshelf was only $20 and my aunt repainted it a cream color. I like cream vs white because it's got a softer feel. We opted to get a dresser with a changing pad on top vs a changing table so that she can grow with it. This dresser was only $30 from Habitat Restore - this is a great resource for getting sometimes new or gently used donated furniture and house wares. There are a bunch of locations in Atlanta. The painting is from Hobby Lobby - we bought gold map pins to stick in locations where the baby has been so far in mommy's belly. The moon night light is from Amazon. The changing pad cover is also from Amazon and the frame is a gift. I started a collage wall with different pictures...it's a little crooked but oh well! 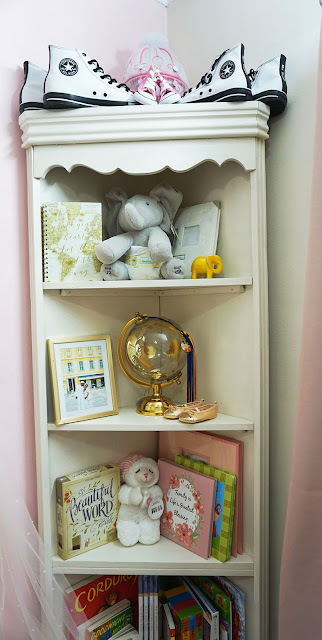 I plan to add more pics and frames as baby girl gets older. The cream colored trash can and pink hamper are from home goods. If you look closely, the blanket hamper and changing pad cover all match with gold colored feathers - totally unintentional. 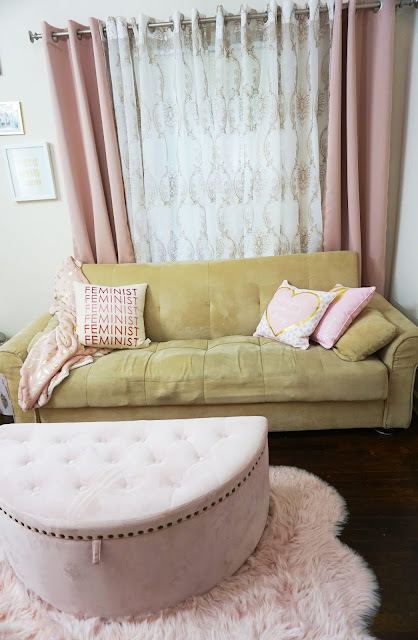 The curtains are from Homegoods - I like this tone of pink. We kept this couch which converts into a bed and decorated it with more pillows. The Feminist pillow is one of my oldies from Urban Outfitters - but I like the message. The rest of the pillows are from Home goods. The rug and storage ottoman are from Ross. We painted the crib wall pink - the rest are cream. 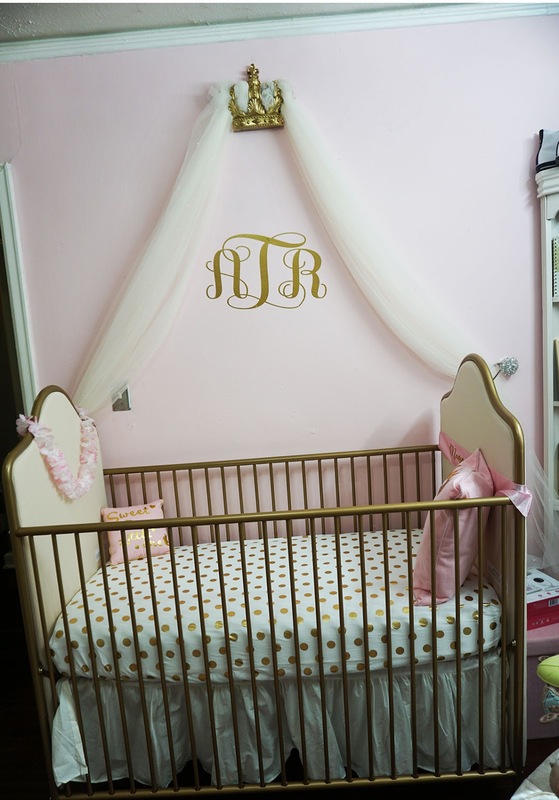 The Vinyl Gold letters are the baby's initials, printed by my sister in law. 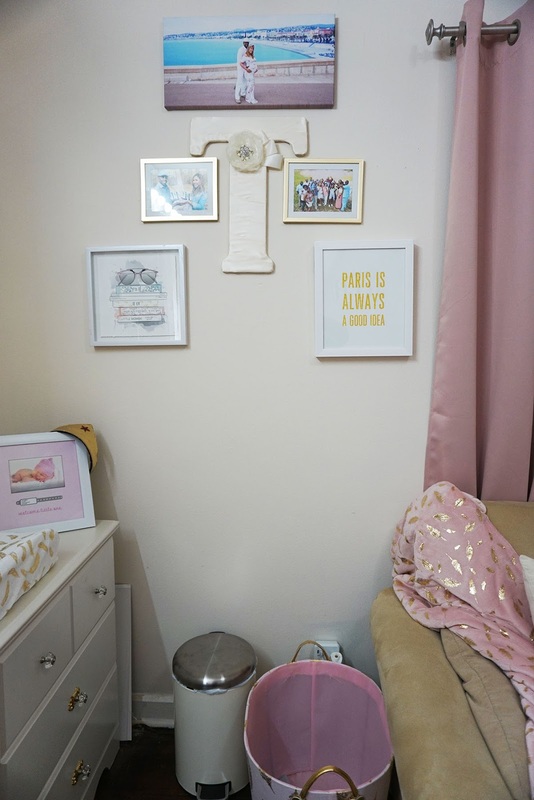 The crib is from Wayfair, the sheets from Target, and crib skirt from Amazon. The crib skirt is good for hiding stuff to store under the crib. When the baby ends up sleeping in the crib we'll take out the pillows but for now it's just for looks. I hope you enjoyed this nursery tour! Sorry the pics weren't the greatest but I shot these in a rush right before we had to leave for the hospital lol.